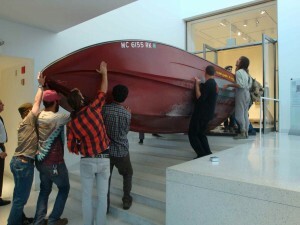 Curators move speedboat into Smart Museum as part of Heartland Exhibit. Chicago Magazine recently profiled Smart Museum of Art “visionary” curator Stephanie Smith in their September 2009 issue. Smith and fellow curators from the Van Abbemuseum in the Netherlands spent the past few years road tripping across the vast interior of America to compile a rich variety of contemporary art from this often overlooked region. The result of their efforts is Heartland, currently on exhibition through January 17, 2010 at the Smart Museum. The curators also compiled a blog that details their multi-year travels through posts and photographs. Of particular note are their recent posts about the challenges of staging the exhibit in the Smart Museum. The above photograph shows the spatial challenge that the curators faced in maneuvering an old speedboat that comprises part of Design 99’s movable sculpture Heartland Machine. To read more about Stephanie Smith please click here. For more information about the Smart Museum of Art please click here, and to read the curators’ blog please click here. Posted in Making Headlines. Tagged with Smart Museum of Art.